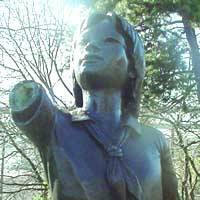 HIROSHIMA - The repaired statue of atomic bomb victim Sadako Sasaki in Seattle Peace Park in Washington state will be unveiled Friday, the 59th anniversary of the 1945 bombing of Hiroshima, after it was vandalized last year. 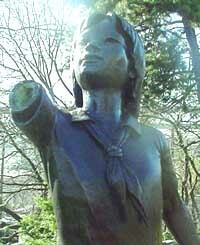 The statue of Sadako, who died of leukemia in 1955 at age 12 after being exposed to radiation from the U.S. atomic bombing of Hiroshima when she was 2, was vandalized in December and lost its right arm. People around the world made donations for its repair. Peace activist Michiko Pumpian, 49, who lives in Seattle and initiated the donation drive for the repairs, said the renovation involved many people and helped spread the call for peace. The 1.5-meter statue is a life-size bronze of Sadako. She made more than 1,000 paper cranes when she was hospitalized in the hope that the gods would grant her wish to get well. Seattle Peace Park was built by the late Floyd Schmoe and was dedicated in 1990 on the 45th anniversary of the Hiroshima bombing. Schmoe led a volunteer group to Hiroshima in 1948 and built houses for survivors of the bombing. He received the Hiroshima Peace Prize and was made an honorary citizen of Japan in 1988.